Already the girls at 4 and 6 are coming home from school with Valentines cards, thankfully addressed to Mummy and Daddy. Their view of the whole event is that it is a day for showing people how much we love them. In many ways that would be much nicer than the exclusive emphasis we currently place on the day for couples. Last year I wrote a post with activities and a selection of books about love for little people and there have been such gorgeous publications on the theme over the last few months that a sequel is certainly in order. 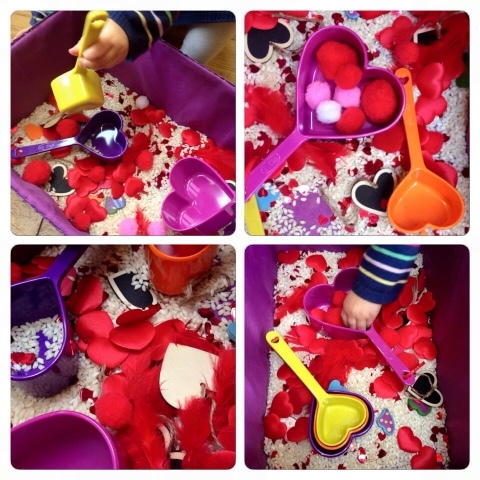 For the very young, here's our Valentine's sensory basket too. You can find out what scrumptiously tactile materials to throw into the mix here. This lovely book has been read and re-read in our household. Both girls love the rhythmic text, the sweet illustrations and the message, that whatever you run out of from food to energy, to socks, from time and money to patience and ideas - you can never run out of love. "Love doesn't come in a bottle or jar. It's right there inside you, wherever you are. You don't have to charge it. No batteries inside. Your love can be big, as the whole world is wide..." At the crux of the book is the central message that love grows when it is given. When you've run out of everything else, you'll still find... you can never run out of love. Long may our girls believe this. Sometimes a title drops through the post that in its own original way gets a message so right that you have to shout about it. This is one of those books. Words and Your Heart is a little book about the amazing power of words, to harm or to build others up. Our words are powerful, they are important, because the words that go into our ears can really affect our hearts too. Just as the words of others can make us happy or want to sing (or make us cry), our words can also pierce someone else's heart - the little bit of them that makes them, them. Our words are so powerful that they can change the way someone's heart feels - our words can make someone who feels weak, feel stronger. The book exorts us to choose to use our words to look after the hearts of others. It's a really important message for school children - teachers have even reported a change in the culture of their classroom after sharing it with their students. It's just as crucial for us as parents. This is one of those books I'll buy for others, and I have a copy to send to school. This cute interactive primer arrived this week, alongside a counting version, and the girls have been busy experimenting with it. With buttons to press, we are taught how to say "I love you" in English, French, Spanish, Japanese and Mandarin. The girls' school does French and Mandarin from reception so they have particularly enjoyed hearing these and looking at the simple phrases such as "You are my friend". Noisy books are always fun and this title from Wide Eyed Editions lives up to their usual high quality quirky standards. When we were married, we both selected Georgian rings. Men's rings of this age are tricky to find as many have been melted down. Ours perhaps survived because of its inscription on the inside 'Love Ever'. It's a Poesy ring - these were given at engagement or marriage and often had inscriptions like ours on the inside. This tale is therefore particularly apt as it traces a journey to the present day of a ring carrying the phrase 'love never dies'. The book begins with a ship sailing away onto the horizon and a teary rider galloping away. A ring is discarded, tumbling into a meadow and settling there with only animals for company for season after season. In time it was found by a boy and placed in his pocket with an acorn, then again it is lost: the acorn becomes a magnificent tree - the ring its hidden neighbour. As the seasons continue to turn the ring becomes wedged in a deer's hoof, is ploughed through soil, carried by birds and dropped into the sea. Eventually found in the belly of a fish, it is finally sold, to be bought by a couple in need of an engagement ring. It's a happy ending for the ring - it finally fulfils its purpose. Love is always there, Bob Graham tells us, it just needs to be found. Last year I wrote about Britta Teckentrup's adorable creation Oskar. Her stunning illustrations and lyrical language and description have ensured that these gorgeous books will be future classics. From the the smell of spring to sweet red cherries, losing himself in books to the silence of snow, Oskar gives us a glimpse into the simple beauty and pleasures in life. Now Oskar returns and he has a best friend Mo. "Oskar loves Mo, and Mo loves Oskar. They are the best of friends." From their favourite place where they share all their secrets, to activities they love to share together, their friendship ensures that the night doesn't seem so dark, the rain so bleak. Even though at times they disagree, they always make up. This is simple and perfect friendship, and the book itself is a work of art. This unusual little book, somehow rather classic looking in its execution but original in the story it tells, talks of the power of falling in love with your passions in life, and in particular with music. Captain Alfred was sailing home with his dog, ducks for his farm and an egg- a precious gift for his wife. Then a storm comes and the boat is wrecked, and floating offshore in a violin case the egg cracks and Alfred Fiddleduckling emerges alone. The first real companion he sees floating by is the violin and Alfred takes hold of it and embraces it with all his heart. In return the object responds with the most beautiful sound he ever heard. They drift wave after wave through the fog, until they land safe ashore. It is this unlikely love story that leads the others, following the exquisite and familiar music, home too at last. It's a joyful tale about finding your gift. Finally an unusual Valentines title from quirky art publisher Prestel. This mainly wordless book brings together unusual pairings of images, united by the one word that describes them. Words such as bark, ring, crane, tank, fly or sole are depicted in their odd couplings. It's a great book for getting little ones to think differently. Perfect for propping up on the breakfast table and discussing. Disclaimer: We received copies of the books over the last few months for the purposes of a review. I only write about the books that I love. There are all fabulous.